TRAILHEAD ACCESS: From 1-90 Exit 70, go north to FS Road 4818, north for 0.3 mile, then east on FS Road 4818-203 for 0.7 mile (under the powerline) then left 0.3 mile to trailhead. In the future, a new trailhead may be sited on adjacent private land in a logging unit; call the Cle Elum Ranger Station for current information. PARKING AND FACILITIES: Small unimproved trailhead with parking for 4-5 vehicles. Large stock trucks and trailers not recommended due to very narrow access road and confined parking area; parking available out by the powerline. TRAIL: From the south, this trail climbs steadily to the hanging basin at the top of Silver Creek gorge. From there the grade lessens but still climbs steadily, passing through alternating stands of old growth timber and meadows, climbing through an old burn with silver snags. Leaving Silver Creek, the trail stays high on the ridge, passing below Thorp Mountain where it meets the Thorp Mountain Trail #1315.2. 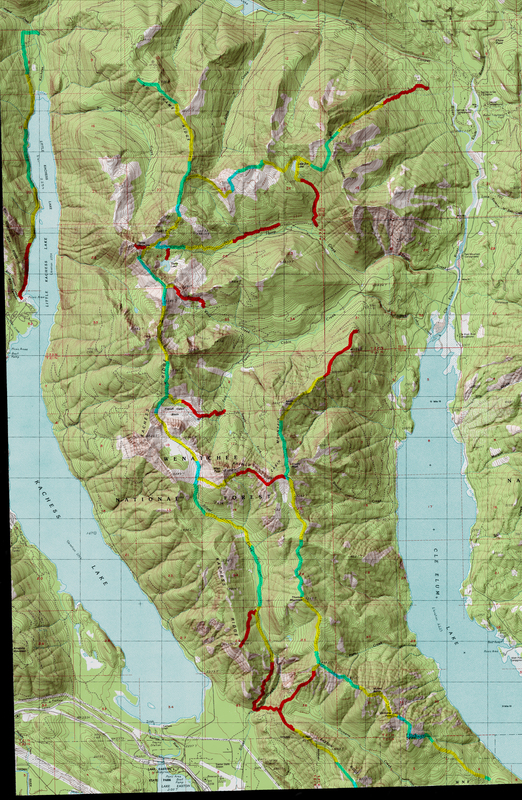 This trail is fairly steep and runs for about 0.5 mile to the top of Thorp Mountain where there are excellent views of the surrounding mountains and Lake Kachess. From Thorp Mountain, the main trail follows the top of No Name Ridge, ending in a clearcut logged in 1988. SETTING: Open rocky hillsides, deep gorge with waterfalls, old-growth timber, meadows, riparian zones, ridgetops, valley bottom, two clearcuts. OPPORTUNITIES: Hiking, horseback riding, scenery, photography, wildlife, wildflowers, fishing, hunting, camping.